Garlic with a punch! 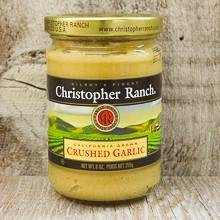 Christopher Ranch Crushed Garlic is made from fresh garlic and packed in oil, making it almost twice as strong as dehydrated garlic packed in water. It’s great as a spread or addition to any recipe that calls for garlic. A must try! Net wt. 9 oz. Ship wt. 1.25 lb.